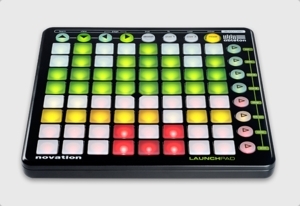 Launchpad is a dedicated controller for Ableton Live, co-developed by Novation and Ableton. Perfect for DJing, performing live or working in the studio, Launchpad features a multi-color, 64-button grid, control modes for the Session View and Live's mixer, two fully-programmable User Modes and dedicated scene-launch/function buttons. Despite the big grid, Launchpad is neat, compact and portable: 239 x 239 mm with a slim 24 mm profile and weighing only 717 g.